The Southern Fuegian Railway or the End of the World Train (Spanish: Ferrocarril Austral Fueguino (FCAF) or El Tren del Fin del Mundo) is a narrow-gauge (0.5 m) steam railway in Tierra del Fuego Province, Argentina. It was originally built as a freight line to serve the prison of Ushuaia, specifically to transport timber. 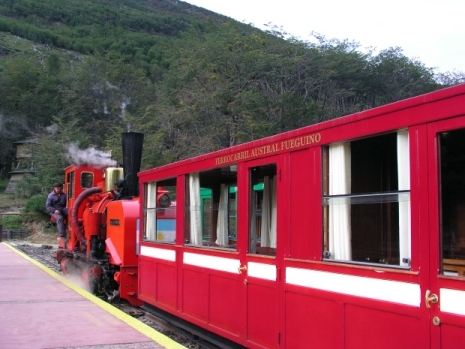 It now operates as a heritage railway into the Tierra del Fuego National Park and is considered the southernmost functioning railway in the world. End of The World Train. In the late 19th century, Ushuaia on Isla Grande de Tierra del Fuego developed as a penal colony, with the first prisoners arriving in 1884. In 1902 work began on a proper set of buildings for the prison by inmates, and a railway on wooden rails was constructed to assist the transport of materials, mainly local rock, sand and timber. Oxen pulled wagons along the narrow gauge of less than a metre. In 1909, the prison governor informed the government of the need to upgrade the line and Decauville tracks at a 500 mm gauge were laid in 1909 and 1910 for use with a steam locomotive. They connected the prison camp with the forestry camp and passed along the shoreline in front of the growing town of Ushuaia. It was known as the 'Train of the Prisoners' (Tren de los Presos) and brought wood for heating and cooking as well as building. The railway was gradually extended further into the forest into more remote areas as wood was exhausted. It followed the valley of the Pipo River into the higher terrain. Constant building allowed expansion of the prison and of the town, with prisoners providing many services and goods. In 1947 the Prison was closed and replaced with a naval base. Two years later the 1949 Tierra del Fuego earthquake blocked much of the line. Nevertheless the government made efforts to clear the line and put the train back in service despite the absence of the prisoners. However the service was not viable and closed in 1952. In 1994, the railway was refurbished and began services again, although now in luxury relative to its origin as a prison train, with champagne and dinner services. A new 2-6-2T steam locomotive (Camila) was brought from England in 1995 with another made in Argentina and three diesel locomotives also serving on the line. Services leave from the 'End of the World' station 8 km west of Ushuaia. The route takes passengers along the Pico Valley in the Toro gorge and to Cascada de la Macarena station where visitors are able to learn about the Yámana people and climb to a viewpoint at a 15-minute stop. 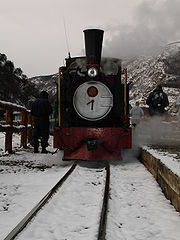 The train then enters the national park and the forest, travelling through the valley below the mountains, reaching El Parque station where tourists can return by coach or train. There is a plan to extend the line to a new station closer to Ushuaia and connect the station to the city with a tram. This page was retrieved and condensed from (http://en.wikipedia.org/wiki/Southern_Fuegian_Railway) see Wikipedia, the free encyclopedia, May 2009.